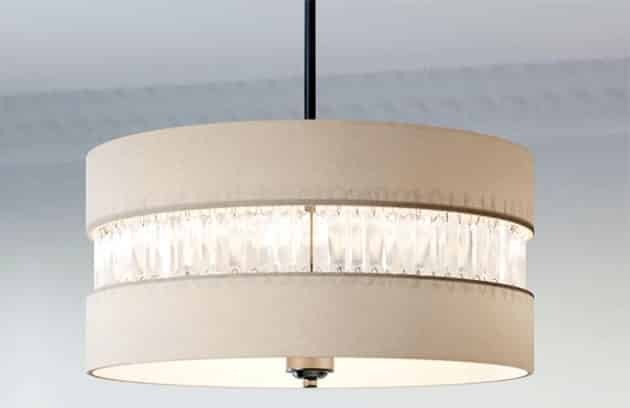 Welcome to our gallery of the top 10 drum pendant lighting for kitchens, dining rooms and bedrooms. 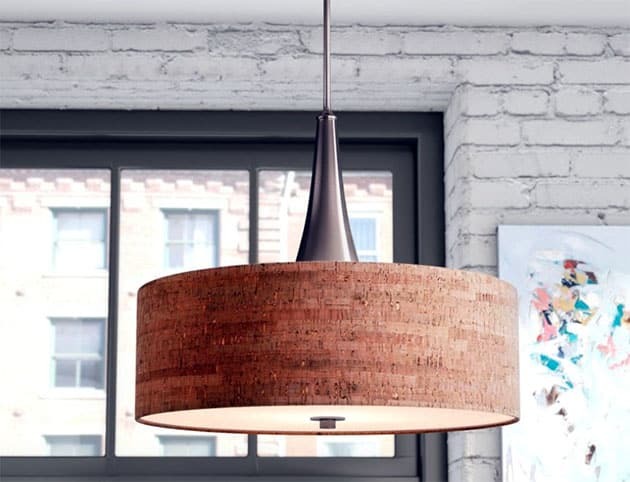 Have a glimpse at what professional residential interior designers are picking from as their top 10 picks of drum pendant lighting. Pendant lighting can drastically change the overall feel of a space. Functionally, they add some much needed light into a room. This is especially useful for spaces that require task lighting such as kitchens or reading rooms. Aesthetically, the lights add some dramatic or ambient atmosphere to any room. As design elements, they can function as conversation starters and interesting accent pieces. In this article, we’ll take a peek at the different aspects of drum pendant lighting usage and design. And later, we’ll be looking at the top 10 drum pendant lighting that you could use for your home. A pendant light is an independent light fixture suspended from above with a cord or fixed rod. Also called drops or suspenders, these fixtures are often hung in series from the ceiling, but can very easily, though not as often, be hung as single units. In either case, they effectively function as design accents that give some character to otherwise bare ceilings. There are different types of drum pendant lights, so much so that listing them all would take all day. However, the types of drum pendants can roughly be classified according to four main characteristics – suspension system, materials, styles, and price. Suspension system just means how the drum pendant is hung from the above surface. It can be hung using a chain or vinyl cord, a series of tension wires, or a fixed metal rod. Materials for drum pendant lighting are innumerably varying. They can be made of steel, aluminum, bronze, glass, and sometimes even wood. 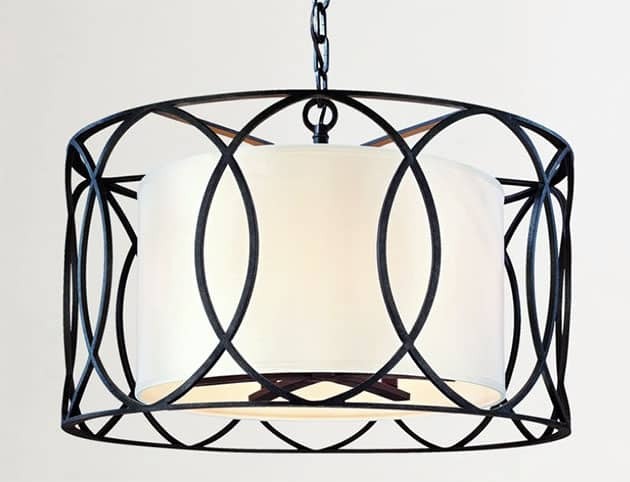 Styles for pendant lighting can also vary based on a designer’s taste. They can be contemporary, post-modern, mid-century modern, classical, etc. 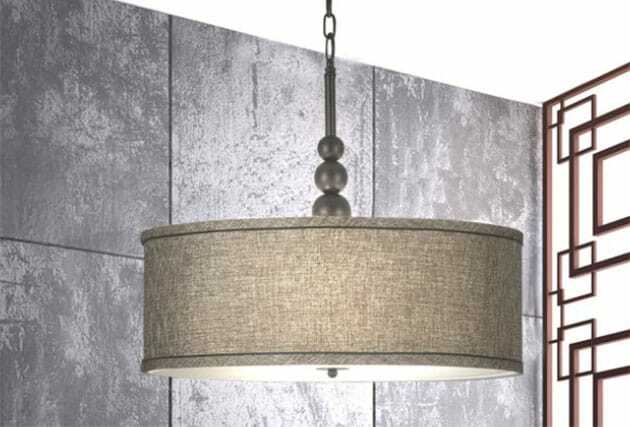 And finally, drum pendant lighting can loosely be classified based on their selling prices. Simpler, less ornate builds will cost cheaper while the more luxurious, branded ones will, of course, cost more. We’ve previously featured different kinds of chandeliers and for most cases, pendant lighting and chandeliers can very easily be confused with each other. Admittedly, the two have very obvious similarities that can be grounds for lumping them with each other. One could even argue that whole concept of pendant lighting is derived from chandeliers, those being in use as early as several hundred years ago. However, there are key differences between pendant lighting and chandeliers – number of lights per fixture and number of fixtures hung from ceiling. Chandeliers often branch off into several different light bulbs or light sources that are hung from a single rope, cord, or rod. Pendant lighting is often just one light bulb suspended from the ceiling. Additionally, chandeliers are almost always used as singular accent pieces and serve as a focal design point for a room’s ceiling. In these cases, chandeliers serve mainly as aesthetic additions to a space. Each pendant lighting fixture on the other hand, very often is used as a part of a series of similarly hung pendant lighting. Although still stylistic, these fixtures are more functional in design than chandeliers. In modern-day design, we have hybrid “pendant chandeliers” that are a bit of a mix between chandeliers and pendant lighting. We’ll take a look at some of them below. A pendant lighting fixture’s main claim to fame is how it is effectively suspended from ceilings above. This is useful in a variety of ways. As mentioned before, there will be rooms in the house that require more specific task-related lighting. An example would be the kitchen counter where a lot of knife handling and food measuring takes place. Reading rooms also require some good amount of lumens for you to be able to read properly. Suspended drum pendant lighting would address all these task lighting needs when utilized properly. Suspended lighting fixtures are also very useful in cases where the ceiling is too high and pin lights are not feasible. This can also be the cases with ceilings where roof beams and rafters are exposed and there’s no ceiling boards to mount pin lights on. In any of these cases, drum pendant lighting would be good ways to circumvent these potential issues. Drum pendant lighting in particular have a round, ring-like band around the light bulb or lamp itself. This is where the “drum” part of the name comes from. The drum serves as a diffuser or lamp shade to regulate the amount of glare and the intensity of the light that comes from the fixture. As such, drum pendant lighting is perfect when you need task lighting but don’t want too much glare. Lastly, with their suspended nature, drum pendant lights are perfect design accents that can really elevate the aesthetic quality and value of any residential interior space. With all these in mind, what specific rooms can drum pendant lighting be used effectively? Here are a few examples. 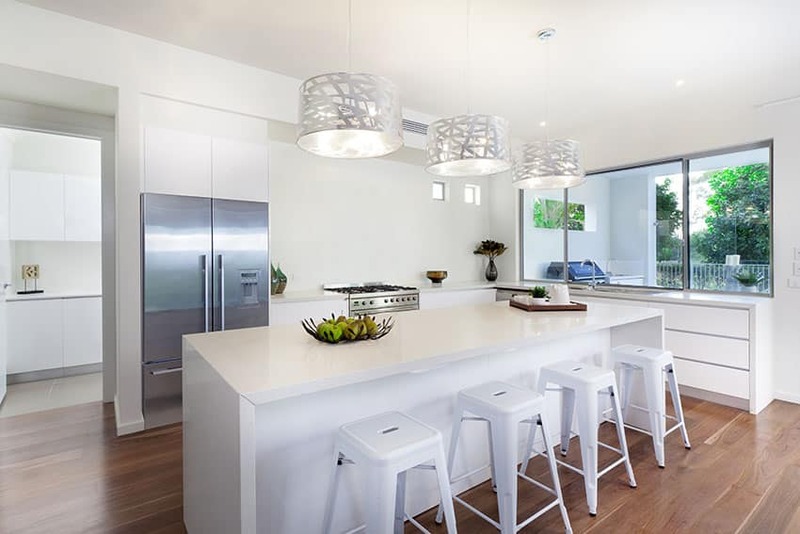 Kitchens – Kitchens are perfect candidates for drum pendant lighting fixtures. 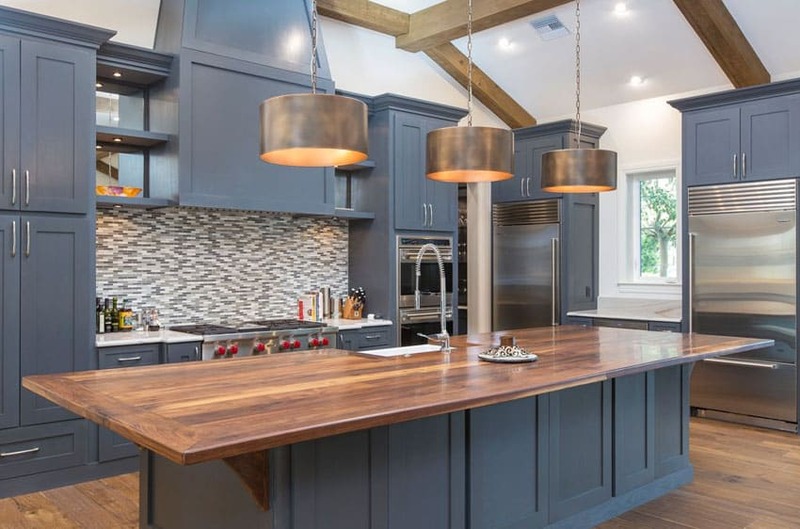 With a plethora of focus-intensive tasks that need ample task lighting, pendant lights are a boon to most home kitchens. You’ll see these types of lights suspended over long counter tops, more often than not island counters. They help with food prep, the actual cooking, or just morning conversations over breakfast on the breakfast bars. Dining Rooms – Pendant lighting is known to add ambiance and some atmosphere to a space. Dining rooms can greatly use this to its advantage. It is not uncommon to see a series of pendant lights suspended either around a dining room table or directly on top. 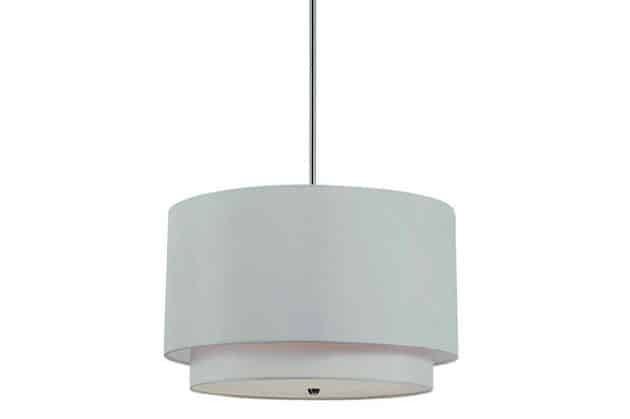 Drum pendant lighting is perfect to reduce glare and regulate the intensity of the light. Visit this page for more dining room lighting ideas for your home. Bedrooms – Bedroom spaces need lots of ample lighting for various reasons. For most homeowners, bedrooms double as home offices or reading spaces. As such, pendant lighting is greatly helpful for when users need to finish a novel at night or need to do some last minute paperwork before they go to bed. Plus, you can’t deny just how good drum pendant lighting looks suspended from the bedroom ceiling. Living Room – A drum pendant light can work especially well in a smaller living room space. For large layouts consider installing two of the same types of drum pendants side by side above the central part of the seating area. Bathrooms – While using a drum pendant light is less common than using a bathroom chandelier they can still be a great choice. Drum pendant lights work best when positioned above a bathtub, hung in the center of the room or as a set above the vanity. Take a look at our gallery of bathroom pendant lights for more ideas. Description: A fresh take on the classic Art Deco design of the 20th century, this three-light pendant is finished in a classy brushed bronze finish with overlapping oval tessellations and a simple, white shear fabric lamp shade underneath. This type of bold yet simple elegance makes this piece flexible and versatile. Use it for your dining room, living room, or kitchen. Description: The beautiful, organic texture of the cork shade contrasts beautifully with the sterility and neatness of the brushed steel base and rod. The soft white diffuser carefully gets rid of any excess glare that might come from the incandescent light bulb within the drum pendant. The trumpet-shaped base is also an interesting design piece suitable for the aesthetic of the fixture. Use it over dining tables or breakfast bars. Description: This three-light drum pendant fixtures has a sturdy, sleek steel frame with a simple white diffuser and fabric drum shade. The shade typically comes in multiple colors to appropriately match your room’s color scheme. This type of drum pendant light is low-maintenance and specifically uses energy-efficient light bulbs. Use it in your dining area or living room. Description: Equipped with a dimming lamp, this drum pendant lighting fixture is perfect for adding a more contemporary and luxurious design accent to your interior space. With an aesthetic and style like this one, this particular brand of drum pendant lighting is best used in master bedrooms or master bathrooms, although using it in living room isn’t a bad idea either. Description: A more minimalist, contemporary take on drum pendant lighting styles, this fixture has a classy, stark, and simple design that’s suitable for more luxurious-themed spaces. The fabric shade sufficiently dims the lamps inside, preventing too much glare. With its lightweight build and its easy to install assembly, this flexible fixture can be used in dining rooms, kitchens, and living rooms. 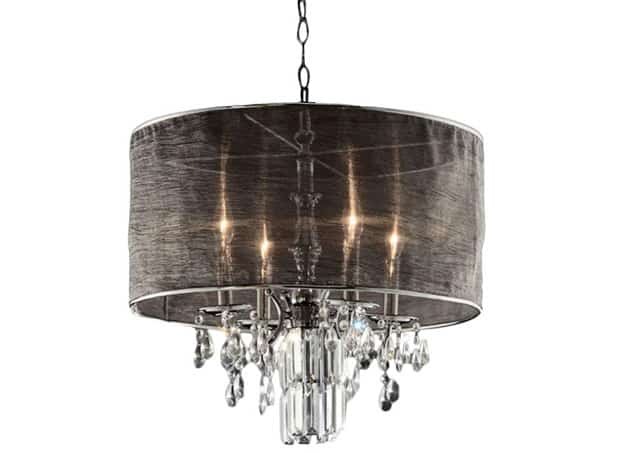 Description: This drum pendant lighting fixture is a good example of a hybrid pendant-chandelier fixture. It has a reasonably luxurious look and uses a darker diffuser to add a more somber ambiance to a space. Its chrome frame adds a nice classy touch as well. Use this on formal dining rooms or living rooms. 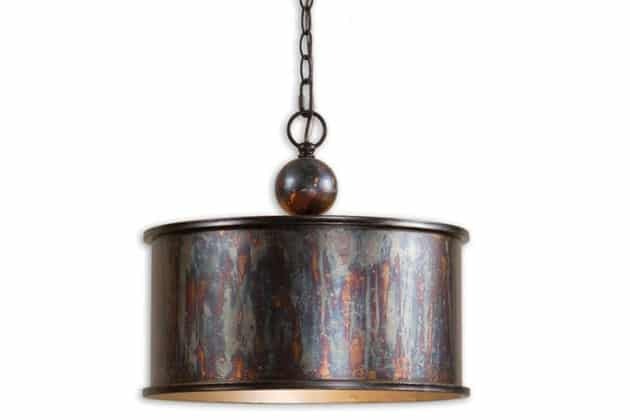 Description: Classy metalwork adorns this neo-traditional drum pendant lighting fixture. A softer, shear white linen lamp shade acts as a diffuser to the assembly and regulates the intensity of the light. Suspend this chain-hung beauty on your dining room table. Description: For homeowners and designers looking for that classic rustic, industrial look, this unique piece of lighting artwork can be effective in giving your room just that extra bit of style. With clear patina markings, a unique multi-colored design is seen on the surface of the metal lamp shade. Use this for your rustic living room or entrance foyer. 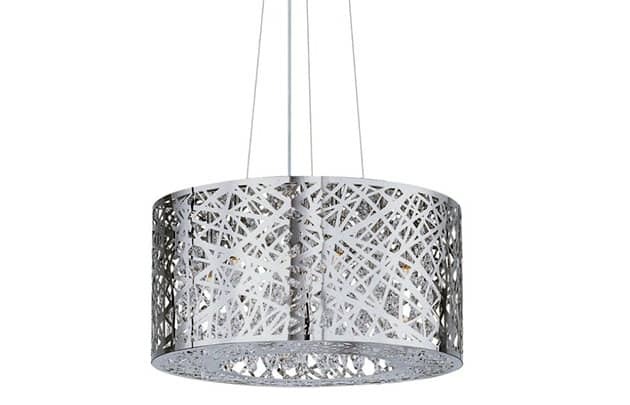 Description: With intricately punched out patterns on the metal shade of this drum pendant lighting fixture, interesting lighting patterns can be produced especially with the ample amount of lumens supplied by the 9 light bulbs that can fit in this assembly. This fixture is also specifically designed to direct light downwards, so it’s perfect for spotlighting counter top areas in your kitchen or reading areas in your living room or reading room. 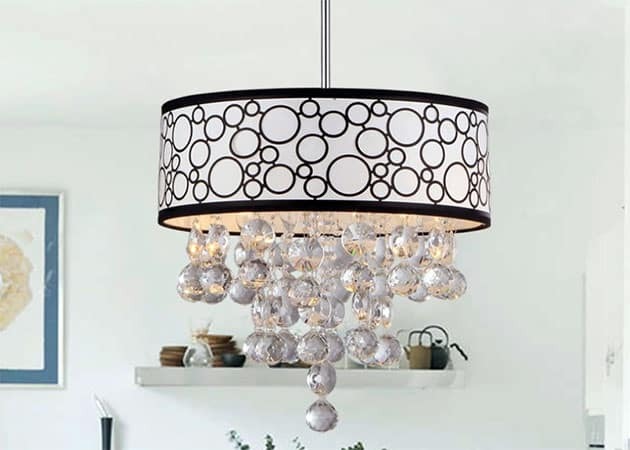 Description: A variety of different materials used on this drum pendant lighting fixture – namely, white sheer fabric, patterned black metal framing, glass droplets decor, and stainless steel suspension rod – this design element embodies the essence of eclectic design. With this eye-catching display of style, use this for entrance foyers or hallways for your guests to enjoy. 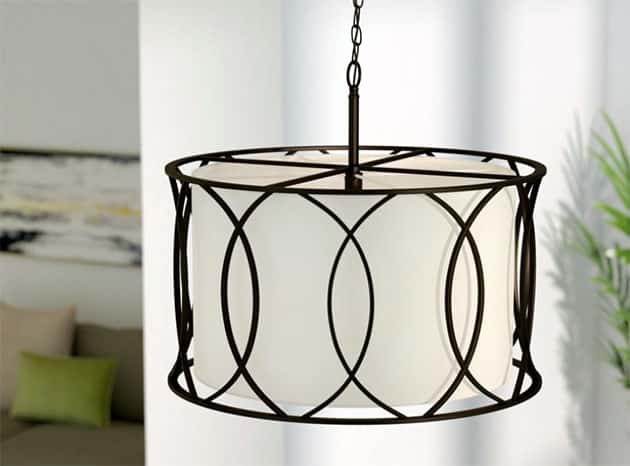 We hope you enjoyed our top 10 drum pendant lighting picks. Visit our lighting page for more home lighting ideas.